Blackberry Smoke has never been a band that stands still. Whether pursuing the dream by logging hundreds of thousands of miles on America’s highways and abroad or relentlessly exploring the many facets of its most unique art form, the Atlanta quintet is always on the move. The songs on Blackberry Smoke’s sixth album, Like an Arrow show just how far this authentic American rock band has come as the accomplished group of musicians tackles a diverse set of new ideas, sounds and territories, long after most bands with half the success might have settled into a well-worn groove. Like An Arrow continues the trend of sonic exploration established on the Blackberry Smoke’s previous two releases, 2012’s The Whippoorwill and 2015’s chart-topping Holding All the Roses. It kicks off with the band’s heaviest song to date and explores British rock before moving on to musical stops in places like Macon, Woodstock, Muscle Shoals and Tulsa as Starr and his buddies follow the ramblin’ examples of timeless, authentic acts like The Allman Brothers Band, JJ Cale, The Band and others who define rock ‘n’ roll in all its many facets. That’s what Starr (lead vocals, guitar), Paul Jackson (guitar, vocals), Brandon Still (keyboards), Brit Turner (leads drums) and Richard Turner (bass, vocals) have been doing for 16 years now after forming in 2001. 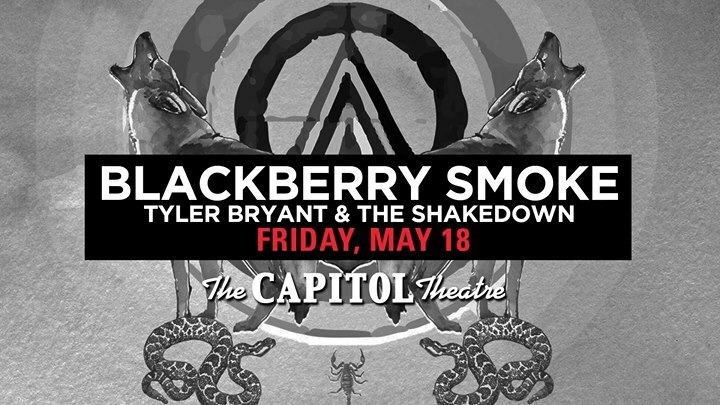 The quintet’s blue-collar work ethic, road-dog attitude – the band averages 250 shows a year – and willingness to jam all night long have left Blackberry Smoke with a grassroots fan base that continues to grow show by show. Holding All the Roses, produced by Grammy Award winner Brendan O’Brien, debuted at No. 1 on the Billboard Country Albums chart and No. 7 on the Rock Albums chart, proof of the band’s universality. Praised by fellow artists as diverse as Dierks Bentley and ZZ Top’s Billy Gibbons, Blackberry Smoke now delivers an album that should invite even more fans under its revival tent. Produced by the band with O’Brien’s engineer Billy Bowers handling the recording, Like An Arrow sounds and feels exactly how the band wanted it to. Like An Arrow leads off with “Waiting For The Thunder,” a song driven by dark images, towering guitars and Still’s storm-driven B3 Hammond organ. Starr says the song sets the tone for where the album lives. The band continues its exploration of amped-up territory on the title track, a psychedelic blast of heavy metal transcendentalism. Blackberry Smoke heads hard in the other direction, too, backing off the four-on-the-floor for different textures. “Believe You Me,” for instance, is a disco-tinged, bottom-heavy blast of country funk. “Sunrise In Texas,” a Michael Tolcher song that’s been a fixture in Blackberry Smoke’s live set for a decade, finally makes it onto album here, also because of its uniqueness. The song opens with dobro and electric piano before building to a long-form crescendo that lets the band show off its well-honed musicianship. “Running Through Time,” written with friend Travis Meadows, takes a look at life through the eyes of an old man looking back at the struggles of his youth on a song that’s carried along on an airy, lilting guitar line like nothing else the band’s recorded. Gregg Allman joins the band on “Free On The Wing,” a song that brings it all back home after the musical journey.